Sikkim, an independent monarchy till 1974, is a small mountain state with the Kanchenjunga looming in the horizon. Ancient monasteries, beautiful lakes, excellent trekking routes, great food, and friendly people make Sikkim a fabulous destination in the North East. Pelling, a small hamlet in western sikkim, offers fabulous views of Kanchendzonga, lovely walking trails, buddhist monasteries all within walking distance of each other. Things to see and do : Pemayangtse Monastery, Rabdentse Ruins, Sanga-Choling, Yuksom, Khecheopalri Lake, Tashing Monastery, and Treks. When to go : March through May, September to November. Stay in Pelling and make day trips to the neighboring places. Have a meal in the gardens of Elgin Mount Pandim. It offers fabulous views of the mighty Kanchendzonga. 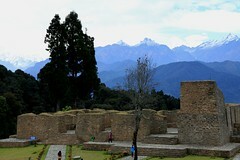 North Sikkim, consisting of northern and central parts of Sikkim, is the very quintessence of natural beauty in Sikkim. Numerous passes, valleys, waterfalls, springs, and a variety of flowering plants all add to the beauty of the region. Things to see and do : Chungthang, Lachung & Yumthang Valley, Zero Point, Lachen & Gurudongmar Lake. Permits need to be obtained from Gangtok even for Indian nationals. Plan to spend at least 3 days in the region. Gangtok, capital of Sikkim, is an ethnic melting pot with a mix of Tibetans, Lepchas, Bhutias, and Nepalis. Brightly colored buddhist monasteries dot the landscape with inspiring views of the Kanchendzonga in the background. Things to see and do : The Ridge, Namgyal Institute of Tibetology, Enchey Gompa, Nathu la Pass and Changu Lake. When to go : April through May and October (after the monsoons). The trip to Nathu La Pass and Changu Lake will take up an entire day. 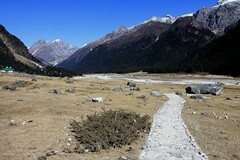 It is more popular amongst the Indian citizens since one can get to see the India-China border from there. Hence non Indian citizens may not find it as interesting. Apply for your permits for North Sikkim as soon as you get to Gangtok. Plan your trip around the permits. I have been reading and using your website, since last 3 years. I have found it very useful. I am planning for a trip to sikkim for 8-9 days in last week of Sept, extending upto October 5th. Please suggest me the places, I should visit. Thanks in advance. Btw, I have used your site for Champaner, Baroda, Junagadh, Agra, Jodhpur, Udaipur etc. It has been tremendously helpful.